On Saturday, July 22, 1620 (according to the Julian calendar, August 1 according to the Gregorian calendar) a small (60 tons) ship left from the quay at Delfshaven. It was the Speedwell, bought and rigged out in The Netherlands, but paid for by an English merchant company, the Merchant Adventurers. A few dozen English men, women and children were on board. They were at the beginning of a voyage that would become famous in world history. But who would have guessed that then? They took a last look at their many friends, relatives and acquaintances who had come to see them off, and listened one last time to their minister, Rev. John Robinson, whom they had heard preach so often in Leyden. That city had been their home for eleven years. Overcome by tears they knelt down and prayed for a safe voyage. Even the Dutch people on the quayside, who were surely used to seeing ships leave for unknown destinations, could not watch the scene unmoved. But then the “tide, which waits for no man” called them away. Who were these people who called themselves ‘Pilgrims’? They were English migrants, who had fled their home country because they did not wish to adhere to the State Church, the Church of England. Since the end of the 16th century English religious refugees had settled in Amsterdam, where they had established their own church, the Ancient Church. They were strictly Calvinistic, but even so their community was not acknowledged by the Dutch Reformed Church. They were not allowed to use existing church builidings, and the city did not pay for their preachers. It must be noted that within the Ancient Church there was much discord. So when in 1608 a new group of refugees from England arrived in Amsterdam its leaders soon decided to leave the city and move to Leyden, where they could live according to their faith, and in peace. Leyden welcomed them, so long as they conformed to its laws and regulations. This was a slap in the face of King James I of England/VI of Scotland, but Leyden did not yield to English pressure. The group built a house for their minister, the Rev. John Robinson, with twenty small dwellings for the poorest people in their congregation. Most probably Robinson’s house, then at the Kloksteeg, the current location of the Jean Pesijnhof, was used for services, as they were not allowed to use church buildings in Leyden either. After eleven years in Leyden the situation changed. The Twelve-Year Truce ended and the war between The Republic and Spain could flare up anytime. Moreover, they were disappointed in the Dutch, who were too worldly in their eyes. Life in Leyden had been been hard. They decided to leave the city, and to find a place somewhere else in the world where they could live according to their orthodox religious principles. After much deliberation and discussion they chose to settle in Virginia in America. It was a British colony, they would be safe in the vicinity of their compatriots. However, they still needed permission from the King, who was not favourably disposed towards them yet. Their representatives were made to wait for weeks at court, before the answer came that permission had been granted by the King. On the condition that the group of Pilgrims acknowledged the powers of the Crown and the rule of the Church of England in the American colonies. Next question was how to organise and finance the operation. After many disappointments the Pilgrims made an agreement with the Merchant Adventurers from London. This merchant company had more than one hundred years of experience in the wool trade with the Netherlands. They were not the least interested in the religious ideas of the Pilgrims, it was a purely commercial enterprise, at a great risk for the Pilgrims. Like the Pilgrims, the Merchant Adventurers were wary of the risk of the war flaring up again, and they were relocating their staple from Middelburg further North, to Delft. The negotiations with Delft were at such an advanced stage that they had already sent their ships to the harbour of Delft, i.e. Delfshaven. That answers the question why the Speedwell left from Delfshaven. The crossing to England went well. In Southampton the Pilgrims met the other ship that would sail with them across the Atlantic, the Mayflower, which could freight about 180 tons of cargo. Aboard this ship were both fellow-Pilgrims of their own faith, and ‘ordinary’ emigrants. They called the emigrants ‘strangers’, and themselves ‘saints’. 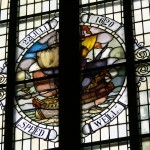 However, as both ships sailed for the New World along the southern coast of England, it became clear that the Speedwell was not an ocean-worthy vessel, and after a few costly and time-consuming unsuccessful repair efforts, it was decided to leave her behind, and only cross on the Mayflower. By now it was already September. It was a bad crossing: tension mounted between the Pilgrims and the ‘strangers’, and in the middle of the ocean they were surprised by a terrible storm. The vessel nearly sank. Miraculously, they reached the American coast in November 1620, only to find that they had landed much further North than intended. They were not in Virginia, but in Massachussetts. Because they did not fall under the jurisdiction of the British Crown there, they drew up a charter on how the new land would be governed: the Mayflower Compact. This document can be seen as the first constitution of the United States of America. More problems were to follow. In the first winter half of the emigrants died, but thanks to their friendly relations with first nation people such as Samoset, Squanto and Chief Massasoit, they managed to survive. When the Mayflower went back to England in the next Spring none of them went back. They became ‘the seed of the nation’. Their arrival in America was first proclaimed a national holiday by president Abraham Lincoln -- Thanksgiving Day. Not all Pilgrims went to America. Most of them, some three to four hundred, stayed in the Netherlands, or went back to England, or moved elsewhere in due course. Those who stayed here were integrated into the Dutch population. In Delfshaven the big questions remains: did the Pilgrim Fathers visit the church or didn’t they? As long ago as the 19th century an American asked the consistory about this. The answer was as short as it was down to earth: “There are no documents in the archive from that time, but we always assumed they have been inside the church.” However, this assumption on the part of the consistory seems to be 'wishful thinking'. There is no proof the Pilgrim Fathers were in the building. William Bradford, chronicler and Pelgrim Father himself only mentions a thanksgiving service in the Pieterkerk in Leyden, and a short prayer on the quay-side at Delfshaven prior to their departure to England. A farewell service in the church would certainly have been mentioned by him. At the end of the 19th century Delfshaven was discovered by the Americans. In 1866 the consistory received a letter from Dr Cohen Stuart from Rotterdam, in which he asked on behalf of a congregation in Chicago for a memorial stone that could be cemented into the walls of this church, whose members were descendants of the Pilgrim Fathers. It was thought to be a fitting way to keep the connections with Delfshaven alive. The consistory agreed and sent a small gravestone from 1595 to Chicago. As a token of their gratitude, they in turn sent a memorial stone similar to that which their church had been built of. Later a print was sent, depicting the first sermon of the Pilgrim Fathers in America. It can be seen in the 'Pilgrim Fathers Memorial'. In 1890 the Holland America Society from New York also requested a relic from Delfshaven, and the consistory sent them a piece of oak wood, from which they made a gavel for the chairman to use at their meetings. They certified that the wood had been the threshold between the church and the vestry. Seven years later, the consistory parted with an offertory box, given to Louis Clark Vanuxem for the benefit of an American society that honours the memory of the Pilgrim Fathers. This gift was reciprocated by 50 dollars, plus the promise the society would hold an annual collection for the church. In 1906 the church was given a brass plaque from the Boston Congregational Club in gratitude for Dutch hospitality towards the Pilgrim Fathers. This donation commemorated that it was 300 years since a church was founded in Scrooby, by those later to be known as Pilgrim Fathers. Next to this plaque a certificate is displayed, which was given in 1970 by Dr R. M. Bartlett from Plymouth on the occasion of the 350th anniversary of the Pilgrims’ leaving Delfshaven. PICTURE CAPTION: On August 1, 1620, the Pilgrim Fathers left Delfshaven aboard the Speedwell. The stained glass window (1912) commemorating this, however, dates this event as July 22, 1620. There is no mistake, both dates are correct. In the times of the Pilgrim Fathers certain places still used the Julian calendar, according to which it was July 22, and other places had already adopted the Gregorian calendar we still have today, according to which it would be August 1. On December 10, 2009, the United States ambassador to the Netherlands, Mrs Fay Hartog Levin, officially opened the Pilgrim Presentation of the Pilgrimfathers’ Church in Delfshaven. The Pilgrim Presentation tells the story of the Pilgrim Fathers in words (both in English and Dutch), pictures, (reproductions of) old documents, artifacts and a short audio-visual presentation. The Pilgrim Presentation is housed in Ankie Verbeek-Ohr room in the Eben Haezer hall. 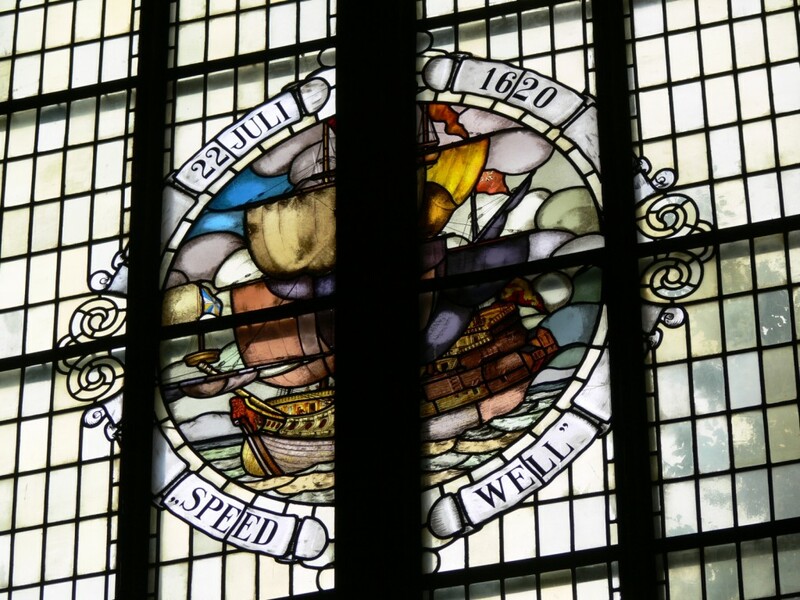 In the sanctuary you will also find objects reminiscent of the Pilgrims, such as the beautiful stained glass window, and models of both the Speedwell and the Mayflower.